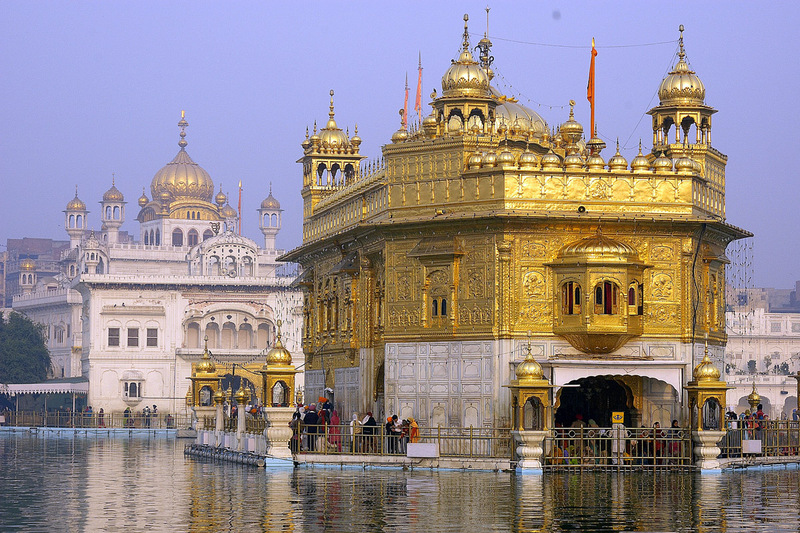 The Golden Temple in India, which is often called the “Darbar Sahib” or “Harmandar Sahib,” is one of the oldest places of worship for the Sikhs and is located in Amritsar, Punjab in India. It is considered one of the holiest, blessed and sacrosanct places in India. It is a symbol of both beauty and peace. The temple is surrounded by a small man-made lake which has a lot of fish in it. This lake is said to consist of holy waters. The temple can be entered from four different sides and thus symbolizes openness and acceptance. This concept is based on the tents which would open from all four sides, welcoming travelers from all directions. The Golden Temple has three holy trees. There is also a small Sikh Museum near the Ghanta Ghar, or clock house, in Amritsar which is very rich in information. The entire top of the temple is made of pure gold and thus adds a lot of pride and beauty to the entire temple. During the earlier days, this place was a huge lake surrounded by a thin line of forests. It is also said that Buddha journeyed here to find the real meaning of life and spent some considerable time in this place. The first guru of the Sikh community called the Guru Nank also used to meditate in this peaceful place. Years after he passed away, many of his disciples kept coming back to the site as it was considered a sacred place. It was during the time of the Fifth Guru, Arjana when the Temple was finally built in 1604. It was Guru Arjan who installed the Guru Granth Sahib hymn book in the temple and appointed the first reader in August 1604. The temples architecture has both Hindu and Muslim qualities. i am doing a project and i need to know cause im confused is amristar a sikh, hindu, muslim or buddah place or is it all??? I just came onto your post and found it quite interesting. I am also associated with hotels in amritsar, hotels near golden temple and enjoy to read the stuff on the same as it’s rarely found on hotels. i need some help with a project im doing got any good facts? This is the most boring lesson ever. Last month was my railway exam in Chandigarh. and after exam i reach amritsar panjab.. golden temple is very beautiful temple and place…. this i s very holy place…. my best place. I am very very happy for going golden temple.